Rolls-Royce is expected to bring out coupe and convertible versions of the Ghost, shown. 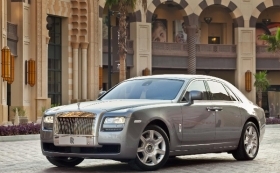 This year's launch of the Ghost -- the long-awaited "baby Rolls" -- is expected to boost Rolls-Royce production to about 2,000 cars in 2010 from 1,200 last year. Now watch for plans by BMW AG's superluxury brand to bring out Ghost derivatives. Ghost: U.S. deliveries of the four-door sedan began in April. The Ghost is 213 inches (5410mm) long compared with the 230-inch (5842mm) Phantom big brother. The Ghost is powered by a 563-hp, 6.6-liter turbocharged V-12 mated to an eight-speed transmission. The Ghost is priced at $247,000 in the U.S., which includes shipping but not a $1,700 gas-guzzler tax. Over the next few years, Rolls-Royce is expected to bring out coupe and convertible versions. Phantom: No major changes are expected for the sedan, Drophead Coupe or Coupe versions for several years.